Ever since the production of synthetic diamonds began in 1953, a debate has raged regarding which is better: Natural or synthetic, earth-mined or lab-grown. The argument has become more relevant than ever since technology has become advanced enough to produce gem-grade diamonds suitable for jewelry. Now, people can purchase real diamonds (with the same chemical composition, look, feel, and grading of natural diamonds) that were grown in a lab. Despite the argument regarding which diamonds are better, synthetic diamonds have one major advantage over natural diamonds: A smaller overall impact on the environment. That advantage is leading many customers to abandon natural diamonds in favor of synthetic. There are several ways in which lab-grown diamonds have less of an environmental impact than do natural diamonds. Lab-grown diamonds require less energy to produce than do natural diamonds. These energy savings are good for both the environment and for customers’ wallets. While some energy is required to produce the high temperature, high pressure environment in which synthetic diamonds grow, that is not nearly as much energy as is required to produce natural diamonds. Energy usage varies widely across both the mines that produce natural diamonds and the labs that grow synthetic diamonds. However, some comparisons have been made between specific mines and specific labs. And in many cases, the labs use less energy. For example, one of the largest producers of natural diamonds uses an average of 80.3 kilowatt hours per carat over all of their mining operations, while anywhere from 20-28 kilowatt-hours per carat is required to produce diamonds through the synthetic diamond labs whose energy usage has been studied. Why is saving this much energy good for the environment? Using less energy translates into using fewer resources such as oil and natural gas. It also means causing less pollution that can damage the environment over time. An additional advantage for consumers is that less energy usage contributes to lower prices. On average, synthetic diamonds cost 30 percent less than do natural diamonds, making it easier for consumers to afford a real diamond for their jewelry purposes. Lab grown diamonds cause less damage to the Earth than do natural diamonds, because they do not require the movement of any land, water, or other physical features. The mining of natural diamonds creates a great deal of change in the surrounding environment. For example, some mines can be more than 2 miles deep, meaning that all of the earth within that 2-mile depth must be excavated. In fact, finding 1 carat worth of diamonds requires the movement of anywhere from 200 to more than 1,700 tons of dirt. In addition, the land immediately surrounding the mine is impacted by the production of natural diamonds. For example, the dirt removed from the mine needs to be placed somewhere, which then impacts the area receiving the dirt. The creation of roadways around the mine disturbs the land. And, at times, entire waterways and other physical features are removed to make way for the production of natural diamonds. All of these actions can affect the health and habitat of the animals that live in the area. Synthetic diamonds, on the other hand, because they are grown in a lab, do not affect the physical features of the land. Instead of moving mountains of earth and large waterways, the lab simply places the starter carbon in a machine, where it grows into a diamond of the desired size. As a result, synthetic diamonds have a significantly lower impact on the plants, animals, and land features of the Earth. Synthetic diamonds create fewer carbon emissions than do natural diamonds. Another way to measure the eco-friendliness of lab grown vs. natural diamonds is to look at the emissions that they create. Emissions refers to the byproducts of using materials such as oil and gas to produce the gems. A student at Stanford University compared the energy usage of mining diamonds from one particular Canadian mine to the energy usage of creating diamonds in one particular lab. What he found was that the lab-grown diamonds produced fully ⅕ the amount of carbon dioxide emissions. This equated to 483 million miles’ worth of emissions. While comprehensive research is lacking in this area, this one study indicates what common sense dictates: That diamonds grown in a lab produce many fewer emissions than do diamonds that rely on the extensive use of heavy machinery for their production. 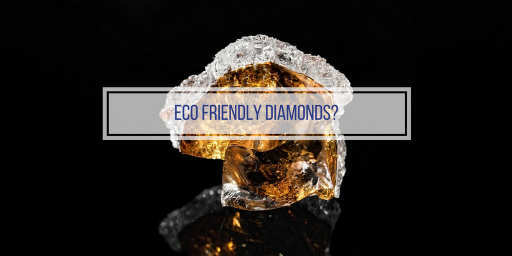 When it comes to eco-friendliness, it is hard to beat synthetic diamonds. Here at Heart in Diamond, we offer yet another reason to consider synthetic gems over natural ones: The ability to turn your loved one into a diamond. Through the use of your loved one’s ashes, we can create a beautiful memorial diamond that you can use to remember them forever. And, you can do so knowing that your loved one’s memorial has been created with a minimal impact on the environment and a maximum effort to create a gem that reflects the value and beauty of their life.